Yay! I made it back this week for another round of Wednesday Ramblings. Once again my partners in crime for this tag team are Bronwyn Green, Kellie St. James, Jess Jarman, Kris Norris, and Jenny Trout. Topic of the week? Celebrity Crushes. Not that I’m not a celebrity crusher (wait, that’s a double negative…what did I even say? ); far from it. In my heyday, which was of course the fabulous ’80s, I had a list a mile long of celebrity cuties…Mark Hamill, John Cusack, Andrew McCarthy (the list goes on and on). Now? Well I had to think about it. I have many many characters I would retu rn to again and again, but a celebrity crush was hard to come up with. In the final analysis, I came up with one. Aragorn in Lord of the Rings. Tom Stall in A History of Violence. However, I notice that I’m listing all his characters again. Maybe I’ve grown from celebrity crushes to character crushes. How about you? To crush or not to crush? I have been faithful to Tom Selleck for 30+ years!! And he is still looking fine!! Yes he is!! Keanu Reeves in The Lake House ALMOST made me be unfaithful to Tom though. 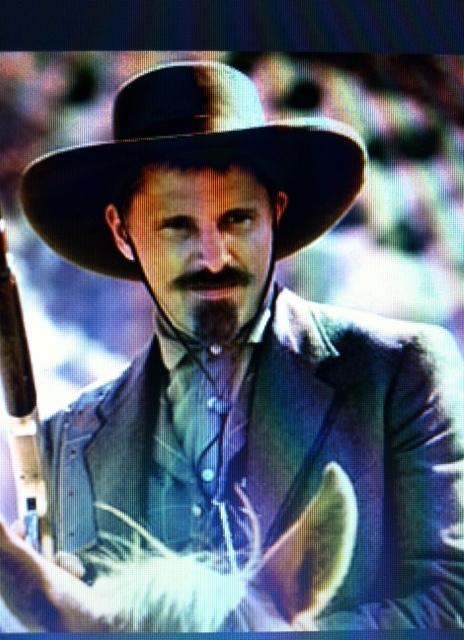 Oh Viggo… ROWR. Good choice. Oh, baby. As someone who watches a lot of movies and has 2 college-aged daughters who let me know who’s hot out there (the 3rd daughter doesn’t so much), I can add to the list. I personally am a crusher on Richard Gere and Jude Law, and I might have to agree with Joselyn on Hugh Jackman………but Tom Cruise has been looking especially fine in his recent movies, Chris Evans was not too shabby as Captain America, and there are many other young hotties out there. Hmmm, that “young” might be the key word, though………..too young for an old lady like me…….but I can dream, right? Yup. Now that mine are getting up there in age, they’re starting to notice those youngsters too. The names of Tom Hiddleston and Aidan Turner come up a lot around our house. Viggo. In LoTR. Holy pants. I complained when he was cast, because I thought he was too young and pretty for the role. But he was PERFECT. Well, I think you hit the nail on the head. I like characters, and the good actors are the ones I fall in love with the characters they play over and over, but celebrity crushes not so much. Tom Hiddleston is just so good at being bad! Wow! Self control has never been mentioned as one of my strong points before. Thanks. I should have sent out an email for suggestions! How did I forget Keanu? Wayyyy back in the olden days…you had quite the thing for Bruce Boxleitner if I remember correctly!! Viggo was my LOTR crush while everyone else my age was crushing on Orlando. The age gap has closed somewhat for me these days.. I’ll add James Marsden and Chris Pine to the list! Oh, and Jeremy Renner. He’s just cool. Also, Eoin Macken, from Merlin. SIR GWAINE FOR THE WIN! James Marsden is a cutey, and yes on Jeremy Renner!! I have to add Colin Firth, as pretty much any character but especially as Mr. Darcy. Gerard Butler has been a good standby crush too. Oh, and I love Collin Firth, too…………..good thing I’m a happily married woman! Behind the Scenes of My Latest Project (AKA Geek Girl Alert)! !